Islands is the second floor apartment in a semi-detached Victorian house within a short walk to the beach and village. It is blessed by a simply lovely view from the large Velux window in the living room and this room has a dual aspect with the front window offering views out over Woolacombe Down, dunes and beach. 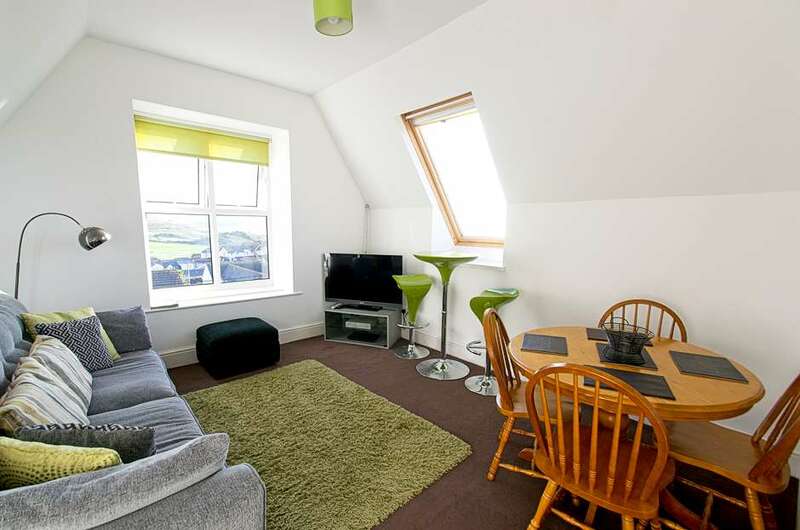 Islands has two good size bedrooms to accommodate 4 people and provides a lovely holiday apartment close to everything Woolacombe has to offer. Having entered the building at ground level just 2 flights of internal stairs lead to the front door. The living room is at the front and side offering the dual aspect views previously mentioned. Light bright and comfortable this room has a dining table and chairs as well as the corner sofa taking in both window views and TV. There is free WiFi. The master double bedroom has ample clothes storage and is of a good size. The twin room is quiet and comfortable for two children or two adults. Again this room has ample storage and window to the rear. I love the mosaic tiled family bathroom with shower over bath, basin and WC. The neat little galley style kitchen has maple coloured fronted units housing a dishwasher and free standing oven, microwave and fridge freezer. With this extremely keenly priced apartment our guests get parking spaces for 1 large or 2 smaller cars, bed linen and towels and heat and hot water included. A good all round apartment, well positioned and at an affordable price for a family of 4 or 2 couples sharing. Travel cot available. Snap it up! Friday changeover.